Please join EPX Civic – Friends of Southwark for our Paper Happy Hour! Paper is always in short supply at our Philly neighborhood schools, so bring a ream (or more) of paper for our wonderful teachers and staff. 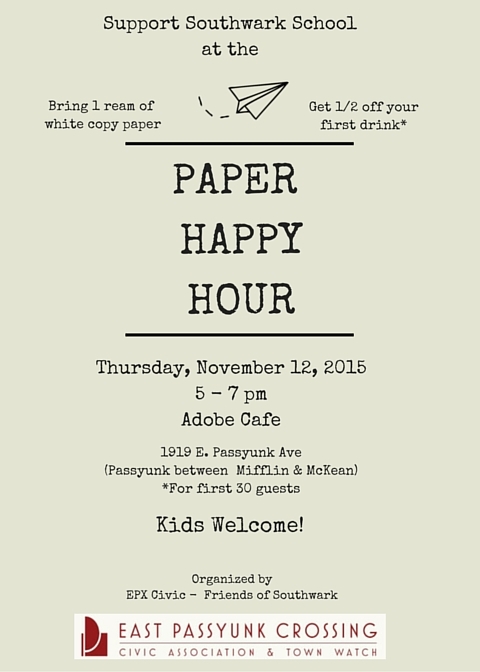 The first 30 people to bring a ream will get half-off their first drink thanks to Adobe’s generous owner. There will also be a chance to mix and mingle with Southwark teachers and staff. Kids are welcome, and EPX Civic – FOS will provide kid-friendly drinks!